Ana joined Altmetric in March 2015 and is now part of Team Hypercube. 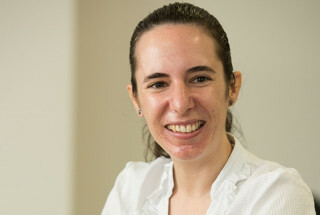 She has a MSc in Computer Science from the University of Coimbra, Portugal, and has been living in London since 2010. She loves dogs, traveling, going out with friends and food. On her spare time she practices Karate and is trying to be a Ninja! I’m responsible for designing the architecture and implementing our user-facing products (such as the Explorer). By working closely with Jean, our Head of Product, we also ensure that the business and technical requirements are fully in sync. In an average day I attend some meetings, write and review code, and work with the team so that we keep delivering awesome features. The best part of my job is being able to continuously learn and grow – not only professionally but also as an individual. We have a great team at Altmetric, and there is also something new that we can learn every day. The most interesting thing I’ve learned since starting at Altmetric is how to deal with large amounts of data. Whenever there’s loads of data involved, there’s an equal amount of challenge and excitement involved. Overcoming the challenge and implementing new ways to process and visualize our data can be truly rewarding. The thing I’m most looking forward to next is our next new challenge. New products and features are what keep us moving, and hopefully, our customers will love them as much as we do.